Gesture is based on Steelcase's global research study and the insights it yielded about how people work in a rapidly changing business environment. 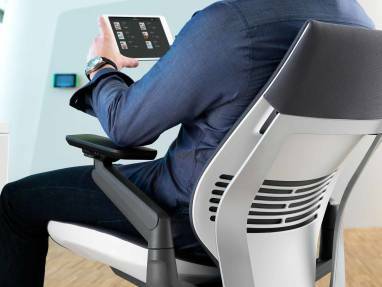 Steelcase, Inc went to companies in the United States, the U.K., and China to see the effect that the Steelcase Gesture chair had on posture, the use of technology, and the health of users. Technology is profoundly changing how we work. A constant stream of new devices presents new ways to interact with these tools, leading to new ways of sittideng. No longer are we focused on one screen and one keyboard. From smart watches and phones to the biggest monitors, our screens are multiplying. We type on physical and touchscreen keyboards on a number of devices. We communicate with colleagues around the world, collaborate on teams, and do focused, individual work. And all day long we move between devices and tasks, changing our focus, shifting our bodies, searching for comfort and support for the task of the moment. These are not merely trends; they are long-term changes in knowledge work. This year alone, 2.4 billion new smart phones, tablets and other digital devices will ship, according to technology researcher Gartner, Inc. Technology tools are being introduced into the workplace so quickly that ergonomic recommendations must quickly evolve to keep pace. A recent study by researchers at the Harvard School of Public Health found that users dramatically change the way they hold their neck and head when they use a tablet, compared to using a desktop or laptop computer. To gauge the effects of new technology and new ways of working, Steelcase conducted a major study of users on six continents, in a cross section of companies across industries. Researchers studied over 2,000 people to understand how the human body is responding to the influx of new technology into our work processes and work environments. The findings are significant. It revealed that many people are often in pain, trying to adapt to rapidly changing technology and ways of working. Researchers also discovered that even the sociology of work is changing as we use a broader range of workspaces than ever before. These changes in technology and behavior have led to nine new postures that people use during the work day, each one a challenge to existing seating solutions. 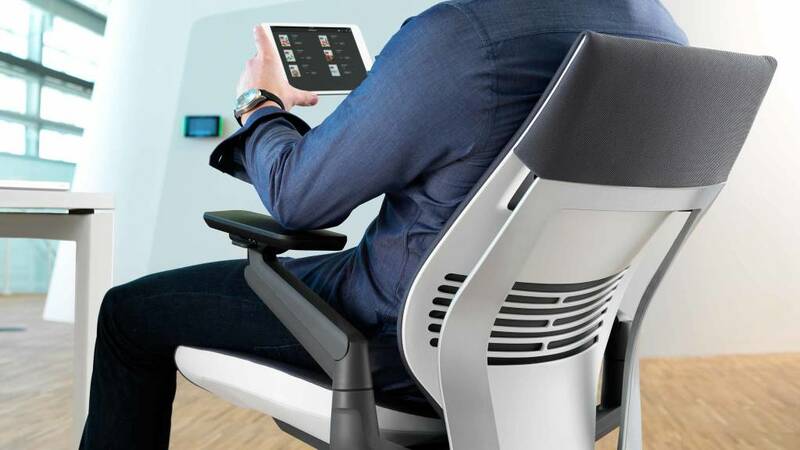 The overall Steelcase research effort, spanning countless hours of data collection, photographs, interviews and observations, can be summed up in one, overarching insight: Steelcase needed to fundamentally shift the way that they approach designing an office chair. Gesture is based on Steelcase’s global research study and the insights it yielded about how people work in a rapidly changing business environment. Knowledge workers change postures frequently throughout the day. They move from task to task, device to device, space to space. Gesture is the first chair to mimic movements of the body and support the user in new assumed postures so the body remains comfortably supported. Gesture is designed to support a globally diverse range of body sizes and shapes as well as a variety of sitting preferences. In addition, Gesture works in many different workspaces, from individual workstations and shared benches to collaboration areas and project studios. As we spend more time in a range of spaces, seating must address the growing need for ergonomic solutions both inside and outside of dedicated workspaces. 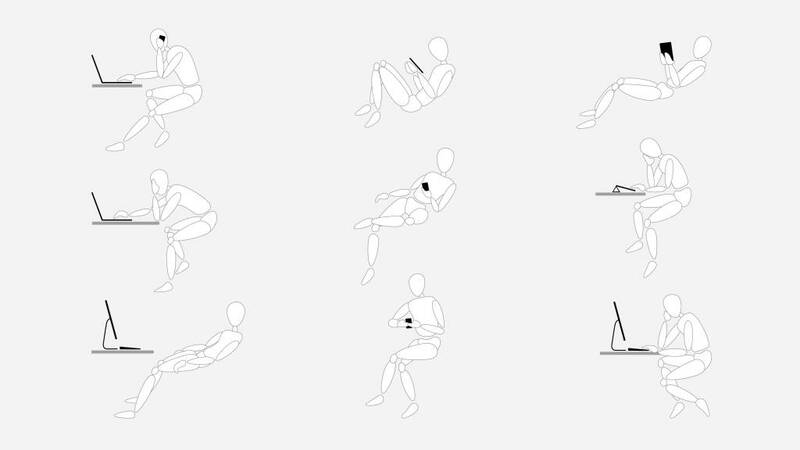 After observing the nine new postures and developing a new chair based on this extensive research, one final question remained to be answered: how well does Gesture provide an innovative new sitting experience for the new ways we work today? Steelcase beta tested Gesture with users on three different continents to find out. Company B, a global financial services company in London, U.K.
Tablets and smartphones are ubiquitous. Company A, for example, had just distributed 500 tablets to employees before the beta test. Employees from the global financial services company were in the midst of receiving their own tablets. Smartphones were common on desks at all three sites, even in call centers; at Company B, the employee’s main phones are no longer land lines but smartphones.Company C however was primarily using desktop computers with smartphones to conduct their work. 62% of people experienced pain from sitting. Tales of visits to a chiropractor or doctor for sciatic pain and other back issues were common. Users care about ergonomics. Many used ergonomic tools such as split keyboards, ergonomic mice, and foot stands, but users could not easily find the adjustments on their chair, leading to a low percentage of people who actually adjust their chairs to fit themselves. Others found it intimidating to adjust their chairs and thought of a chair fitting as an expert activity. Chair arms can be an issue. Despite the fact that armrests can reduce the load on the spine by about 10% of body weight and contribute to comfort and support, few users adjusted armrests to their work. Most left them in one position even though the armrests didn’t provide the necessary support. Armrests often kept the user too far from their work and annoyed the user because they were not in the right place at the right time. In many cases arms were working against the users rather than supporting them. Users were exposed to the gesture chair for the first time when researchers brought the chairs to be user tested at each beta site. They were given gesture chairs to use in their workplace for a period of two to four weeks. Each chair included a standard hangtag with adjustment instructions. Their old chairs were taken away for the duration of the test. Employees’ initial reactions were carefully documented and recorded on video when possible, including how long it took users to discover Gesture’s adjustments. At Company A, for example, users took an average of 103.5 seconds to discover the adjustments and all users found the seat depth adjustment. According to ergonomists, seat depth is arguably the most important control and yet is commonly overlooked. Following the multi-week test period, users completed a survey of their experiences and impressions of using the chair. Researchers also conducted in-person interviews with users. Below are the key findings resulting from this study. Of the 62% of people who were experiencing pain, all said that Gesture helped alleviate that pain. Participants found that Gesture left users feeling more energized at the end of the day. 83% said Gesture offered better support than their existing chair. While researchers did not seek to measure productivity, beta test users said Gesture positively impacted productivity because of increased comfort and support. Researchers explored specific user responses regarding the benefits that people need in a work chair today including adjustability, fit for users of all sizes, and support for new postures and movement. The intuitiveness of Gesture adjustments demystifies ergonomics and helps users understand the way their chair works. Controls were easy to find (two-thirds of users found all controls; no one found less than three of Gesture’s five controls). Users uniformly said Gesture is easy to use. People used the adjustments on Gesture more often than on their existing chair. Gesture comfortably fit users at all beta sites despite significant user differences in physical size. Users reported that Gesture offered a range that fit everyone comfortably; they were impressed by how much the chair could adapt to different people. For example, at the internet services company in China, several people used the same Gesture chair and were easily able to adjust it to their size and preferences. 96% of users said Gesture fit them. Company C users reported that they no longer needed pillows — which they had in their existing chairs— in order to feel comfortable. Gesture helped participants sit in better postures such as reclining, which relieves pressure from the discs in your back, and helped them avoid bad postures such as perching on the edge of their chair. Despite an internal stigma attached to reclining at their offices, Company A and Company B employees reclined more with Gesture and believed they still maintained a professional demeanor. Participants moved more in Gesture, not from discomfort as before, but because they could easily assume the best posture for their tasks. Users changed posture while typing, reflecting, socializing with others, or talking on the phone — postures made possible because of Gesture’s versatility. People were able to move more to adjust to the task at hand. Changes in posture were intentional and purposeful. Modern ergonomics is all about supporting different postures. Research shows that being constrained to one posture, even if it’s a comfortable one, can be detrimental to a person’s health. This is particularly true for the back, which is made up of a series of intervertebral discs. Back health requires movement to diffuse nutrients through these discs. Being able to work productively and get full support in postures ranging from a full recline to upright encourages that movement. “The back is so supportive. I don’t have to adjust how I sit to feel like I have full back support. It’s very fluid. In my other chair, when I lean back I feel lazy. In Gesture I just feel like I’ve repositioned,” said one user about the ability to recline and still be supported. In today’s workplace, chairs need to encourage a greater range of movement, promote a wide array of postures, and support the use of technology. 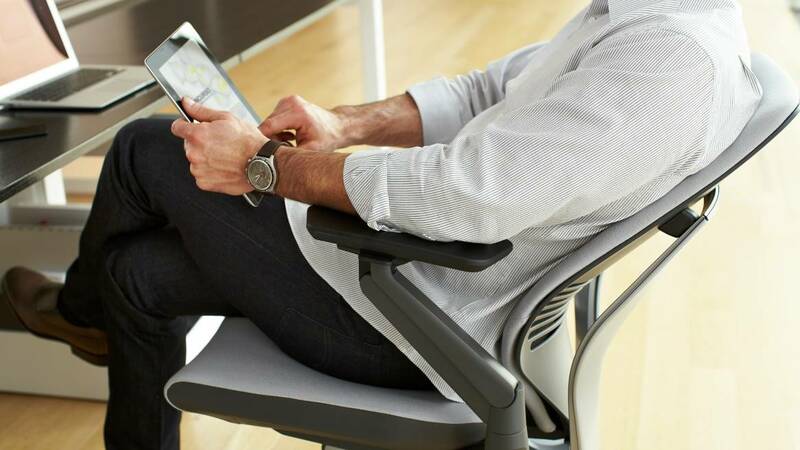 Users noticed a positive change in their health, comfort, and behavior because Gesture is a new sitting experience that was designed for how work is done today.